Startup Nikola Motor Co. unveiled a hydrogen fuel-cell powered 18-wheel tractor trailer truck that will have a range of 800 to 1,200 miles on a fill-up, which is nearly double that of any other semi-truck on the road. The custom-built, hydrogen-electric, 800-volt fuel cell 18-wheeler, a class 8 rig that will be able to haul 80,000 lbs., will be more powerful than any other production diesel truck on the road, the company said. In May, the company announced that its first class 8 semi-truck would be an all-electric vehicle, but in August said it was instead developing a transport powered with a hydrogen fuel cell. 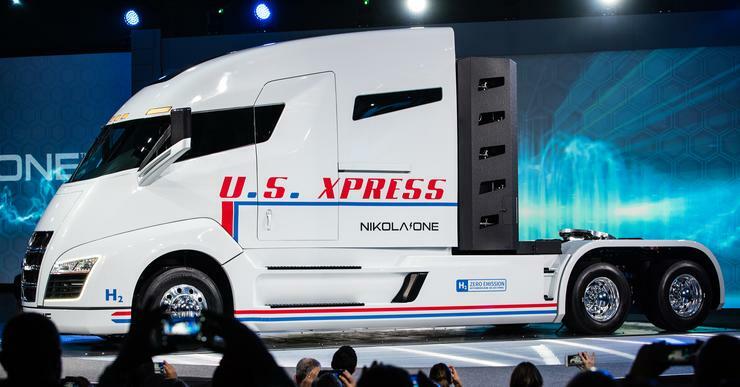 The Nikola One will retail for $375,000, nearly double the price for a standard diesel semi-trailer. To spur adoption, the company is also offering enough free hydrogen for each purchased truck to travel 1 million miles. The Nikola One will also be offered through a leasing program that will cost from $5,000 to $7,000 a month, depending on the configuration and options a customer chooses. It will also include unlimited miles and hydrogen fuel, and a warranty and scheduled maintenance during a 72-month term. In August, the company had said the leasing program would cost from $4,000 to $5,000 a month. At no additional cost, owners can trade in their Nikola One for a new one every 72 months or 1 million miles, whichever comes first. To date, Nikola Motor has accepted reservations totaling nearly $3 billion in future orders, it said. 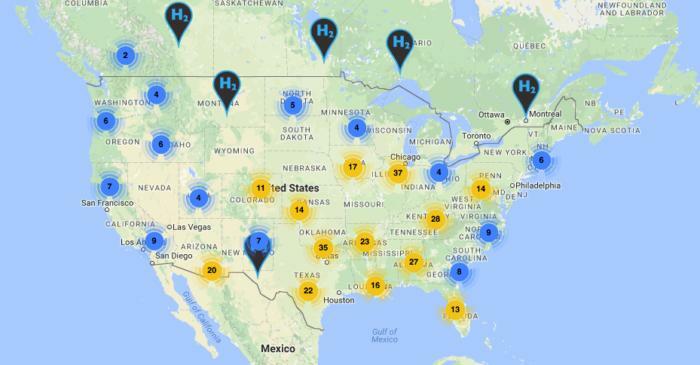 Some of the 364 hydrogen fueling stations Nikola Motor Co. plans to begin building next year. "Nikola will build a world-class advanced manufacturing facility which will create thousands of new jobs," said Nikola founder and CEO Trevor Milton. "Nikola is currently in discussions with several states to decide who to partner with in its effort to reduce America's dependence on fossil fuels, advance green energy and revolutionize the trucking industry. The location of the Nikola Motor manufacturing facility will be determined in the first half of 2017," Milton said. At the same time that Milton unveiled the Nikola One, he also outlined the company's plan to develop a network of 364 hydrogen fueling stations across the U.S. and Canada. Nikola plans to begin construction of its hydrogen fueling stations in January 2018. In conjunction with the fueling stations, Nikola Motor is in the process of developing multiple 100-megawatt solar farms to create hydrogen from electrolysis, the process of separating hydrogen from water, "making it the only fuel that is zero emission from production to consumption." 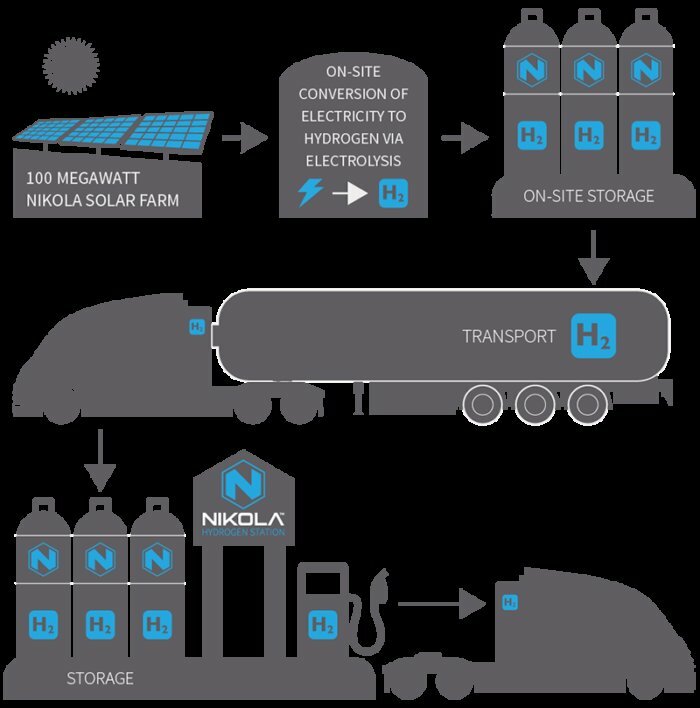 The hydrogen will be transported from the Nikola solar farms to Nikola hydrogen stations by a fleet of Nikola One trucks, running on zero-emission, electric-hydrogen power trains. The hydrogen is stored at Nikola stations in liquid form, and then dispensed into vehicles as compressed or liquid hydrogen. From energy creation to energy consumption, the entire process is 100% emissions free. All non-Nikola vehicles can fill up at any Nikola Hydrogen Station for $3.50 per kilogram of hydrogen. Nikola announced it has also partnered with Ryder Systems Inc. to provide nationwide maintenance at 800 locations across North America, the cost of which is included with leased vehicles. "With a range of up to 1,200 miles, we have you (and the entire country) covered," the company stated.